San Onofre was redesigned for a 7.0 earthquake, but sits near faults capable of 8.0+ earthquakes — 10 times larger, 32 times stronger, and long overdue. See USGS earthquake calculator. USGS predicts probability of at 7.5+ earthquake in Southern California as 36% in 30-years and a probability of a 7.0+ earthquake as 75%. Northern California a 7.0+ as 37% in 30-years. There is no seismic rating for the nuclear waste thin storage canisters that may already be cracking at San Onofre and other nuclear plants, especially in the corrosive coastal environment. Each of the canisters contains more radiation (Cesium-137) than that released from Chernobyl. Nelson Mar, PhD (former Senior Engineer for the original design of San Onofre Units 2 & 3), said San Onofre is not designed for current earthquake or tsunami risks. See 3/27/12 Irvine City Council meeting video. 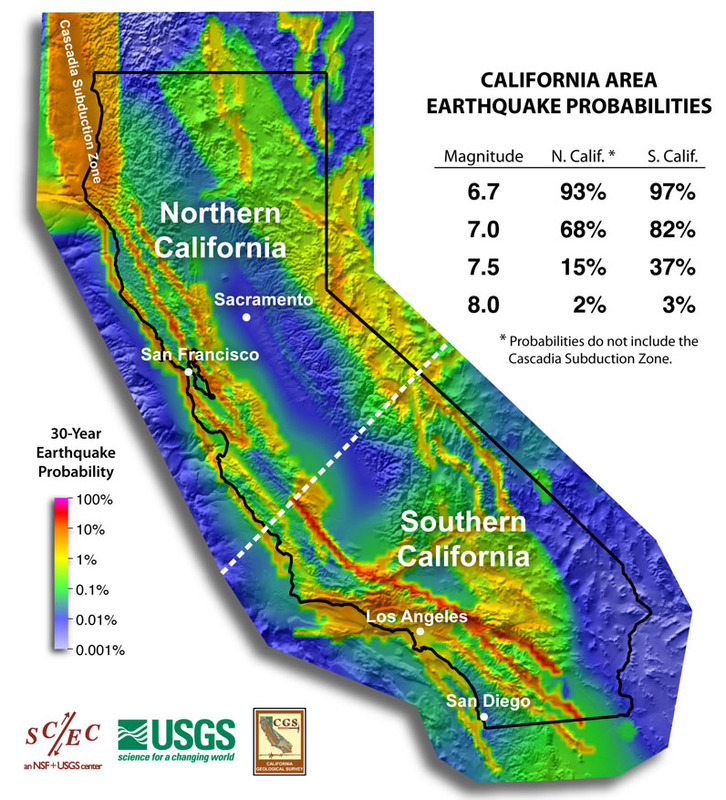 Over the next 30 years the probability of a major earthquake occurring in Southern California is 60% and 67% in the San Francisco Bay area. “Information about how big an earthquake’s going to be may not be in the earth’s crust BEFORE the earthquake begins” says USGS seismologist Dr. Lucy Jones. “The Earth’s natural systems are not static… This is why I personally feel we need to regularly update the scientific data we use to inform our regulatory approach so that our nuclear facilities are adequately protected against unanticipated events”, said NRC Chairman Macfarlane at the November 6, 2012 INPO CEO conference, in reference to the Fukushima nuclear disaster. Professor Thomas Heaton of Caltech’s Earthquake Engineering Research Lab, reveals limitations in designing structures to protect against large earthquakes. Every earthquake has different dynamics and affects different types of construction differently. “All tall buildings are designed to be flexible, but here’s the rub,” Heaton said. “People talk about a building designed for an 8 [magnitude], as if anybody has a good idea of what the actual ground motion would be in an 8. There’s tremendous variation from one place to another.” If you “put a really large quake under downtown L.A., 7-plus, it could be a true nightmare.” L.A. Times, Earthquakes on the brain, April 1, 2014. 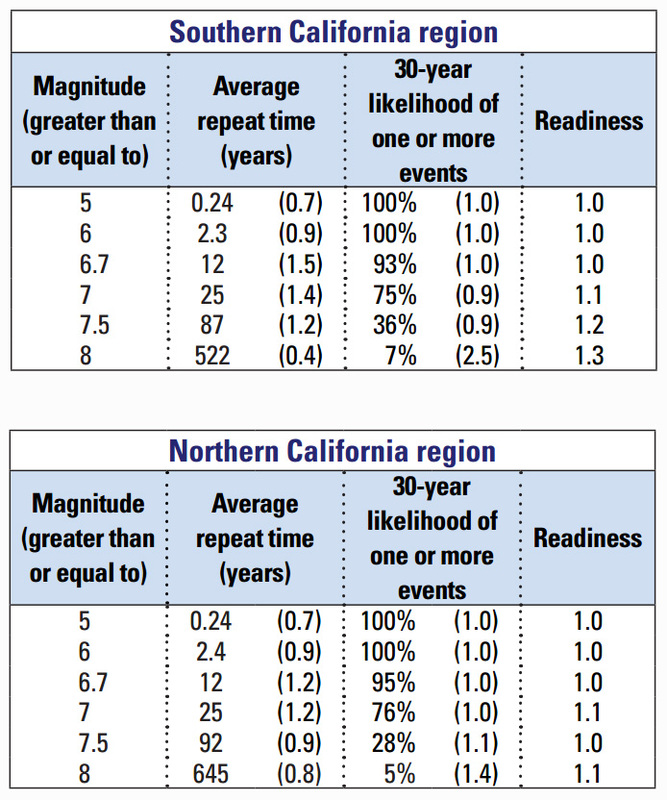 Southern California 8+ earthquake 30-year probability increased from 3% to 7% due to new understanding about how disconnected faults can jump up to nine feet. Fracking for oil is currently being done in Baldwin Hills by the Plains Exploration and Production Co (PXP), a Texas based company, on the Newport-Inglewood fault. Earthquakes have been triggered by fracking. The Newport-Inglewood fault runs by the San Onofre nuclear power plant. 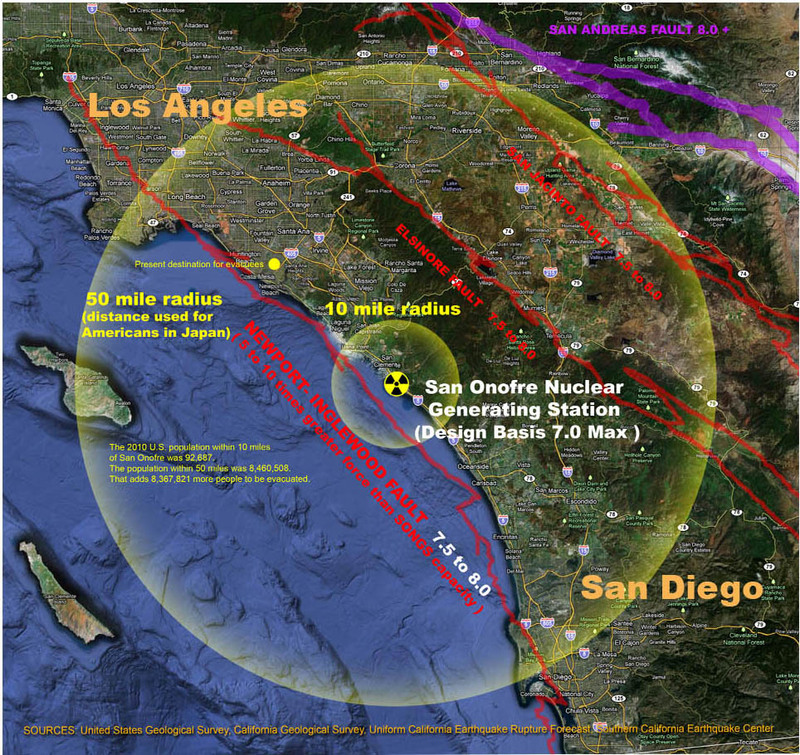 Even though San Onofre is shutdown, the over 1600 tons of highly radioactive waste could be damaged by an earthquake from this fault, resulting in a nuclear disaster greater than the one currently happening in Japan. See also SCEC Final Technical Report, Integration of Fault Information, November 2009, p. 15 & 22. The California Conservation Division of Oil, Gas and Geothermal Resources has authority to regulate fracking, but refuses to do so. The last Division Chief lost her job after supporting stronger regulations. See The ‘F’ Word: Unregulated Fracking at Oil Wells Raising Concerns – KCET SoCal Connected 3/23/2012. “Governor Jerry Brown…”fired two officials who had sharply slowed down the process for issuing new drilling permits. He followed that with the year-end appointment of Tim Kustic as the chief drilling regulator —“a geologist who knows the industry,” says Rock Zierman, head of the California Independent Petroleum Association. Occidental Petroleum CEO Steve Chazen gave Brown a nod at the company’s fourth-quarter conference call in January: “We are pretty encouraged by the way things are going now. . . . The governor is very pro-jobs.” City Journal Summer 2012. 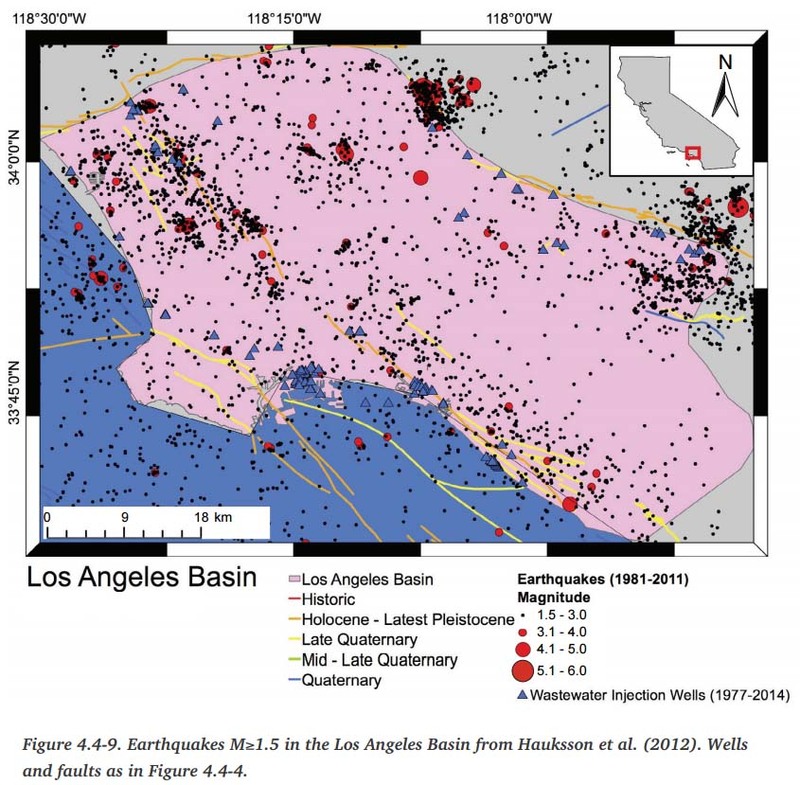 In the Los Angeles Basin (Figure 4.4-9), disposal wells are concentrated mainly in oilfields located along the Holocene Newport-Inglewood fault zone (slip rate 1.5 mm/yr), a segment of which was the source of the destructive 1933 Mw6.4 Long Beach earthquake, and in the Wilmington oilfield. Several wells in the Wilmington field are located within 4 km (2.5 mi) of the Holocene Palos Verdes fault (slip rate 3 mm/yr). Only scattered seismicity has occurred near any these fields except Inglewood and Cheviot Hills at the northwestern end of the Newport-Inglewood trend. As in the Ventura Basin, clusters of seismicity are located close to some disposal wells but also elsewhere. The cluster at the top-center of the figure are aftershocks of the 2014 La Habra earthquake. Earthquakes can be triggered by any significant perturbation of the hydrologic regime. 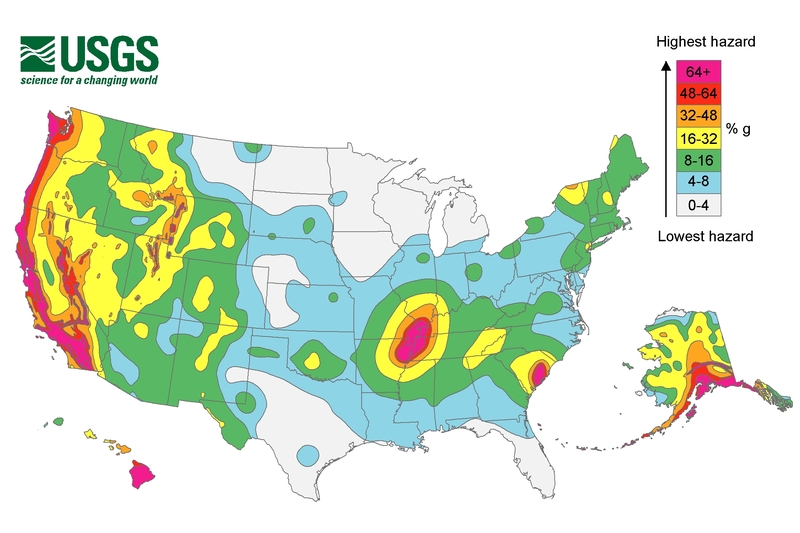 In areas where potentially active faults are already close to failure, the increased pore pressure resulting from fluid injection, or, alternatively, the massive extraction of fluid or gas, can induce sufficient stress and/or strain changes that, with time, can lead to sudden catastrophic failure in a major earthquake. 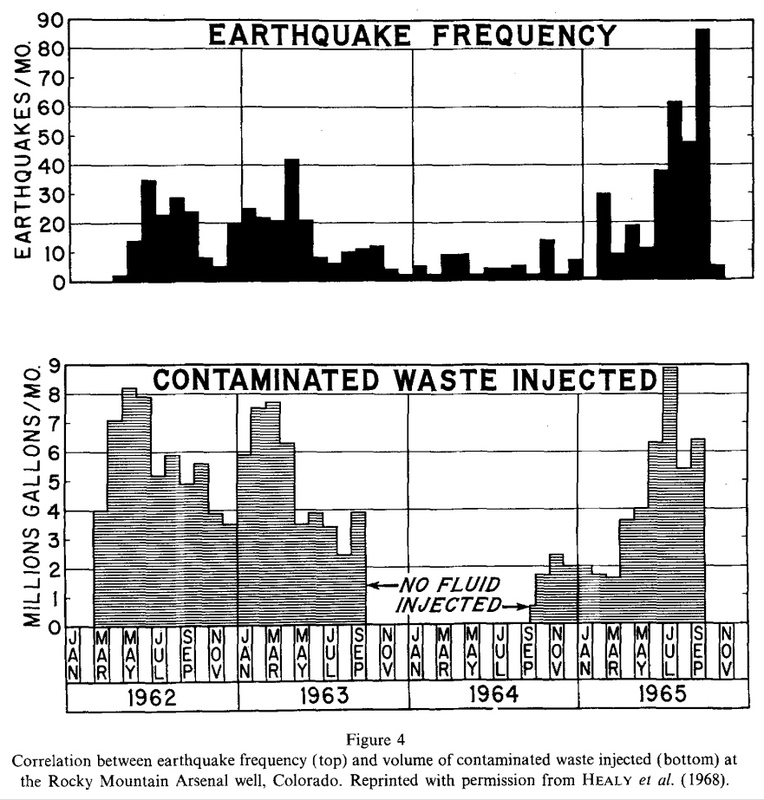 Source: Triggered Earthquakes and Deep Well Activities, Craig Nicholson and Robert L. Wesson, 1992. Lessons learned from the March 11, 2011 9.0 Tohoku, Japan earthquake. Seismologists across the globe were surprised by the magnitude of shaking that occurred in the segment of fault responsible for the Tohoku quake. Japanese scientists had not believed a quake of such intensity could occur in that area, which in turn impacted tsunami strength estimates. Insights gained from the Tohoku earthquake are leading scientists to re-evaluate the way they’ve assumed many other major faults are segmented. This may end up altering some hazard analyses for the West Coast, and will contribute to improved scenario modeling, building code development, and public warnings about tsunami threats. An unparalleled amount of strong ground motion data were recorded. Many cases of liquefaction were witnessed and filmed for the first time. Liquefaction occurs when soil loses strength and stiffness due to an applied stress like an earthquake and behaves like a liquid, often causing damage to structures and infrastructure. Even though the Japanese had planned and were well-prepared for a 200- or 300-year tsunami, they were not prepared for the 1000-year tsunami (an event that’s likely to occur just once every 1,000 years) that came instead. Consequently, Japan is currently updating its tsunami disaster plans for all of its coastal areas and requiring that all plans take evidence from paleo-tsunami deposits into consideration. The United States is also conducting its own paleo-tsunami deposit studies in California, Alaska, the Caribbean, Puerto Rico, and the Virgin Islands to better understand the tsunami risk in those areas. Ratepayers must pay $64 million in new seismic studies. 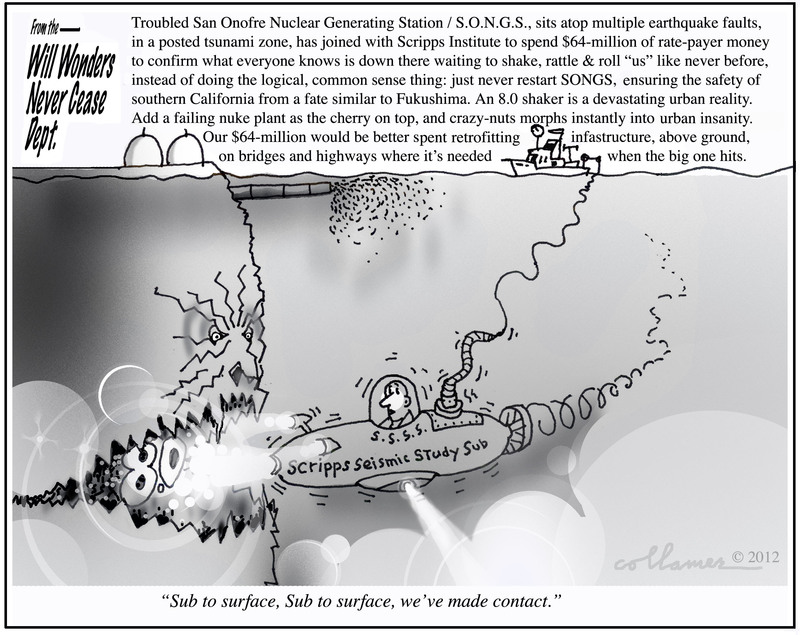 The California Public Utilities Commission is forcing ratepayers to pay $64 million in new seismic studies, even though existing data proves San Onofre cannot handle the current known risks and USGS says size of earthquakes is not predictable (e.g. 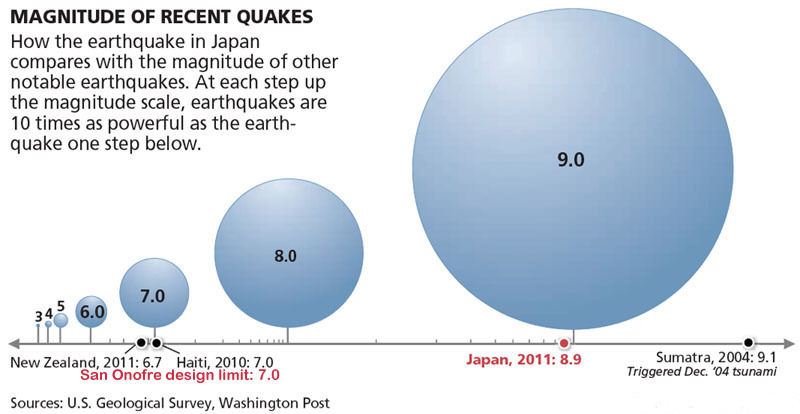 size may change after earthquake begins). Similar $64 million dollar studies were also approved for the Diablo Canyon nuclear power plant. Part of the seismic studies include sonic blasts that will maim and kill large numbers of whales, dolphins, seals, sea lions, otters, and other marine life. See Coastal Commission staff recommendations approved by the Commission. Lessons learned about strike-slip faults from 8.6 East Indian Ocean earthquake. On April 11, 2012, an 8.6 earthquake struck the East Indian Ocean along a strike-slip fault – the largest earthquake ever recorded on a strike slip and 10 times larger than any previously recorded strike-slip quake. San Onofre and Diablo Canyon nuclear plants are located within the “Ring of Fire”. The “Ring of Fire“, also called the Circum-Pacific belt, is the zone of earthquakes surrounding the Pacific Ocean. About 90% of the world’s earthquakes occur there. See animation of 2011 global 6.0+ earthquakes (using USGS data) and more maps below. Mexico’s recent 7.4 earthquake (03/20/2012) was 2.5 times larger and 4 times stronger than what San Onofre is designed for. Japan’s Fukushima Daiiachi nuclear meltdown began after a 9.0 earthquake. Lessons learned about length of a fault. 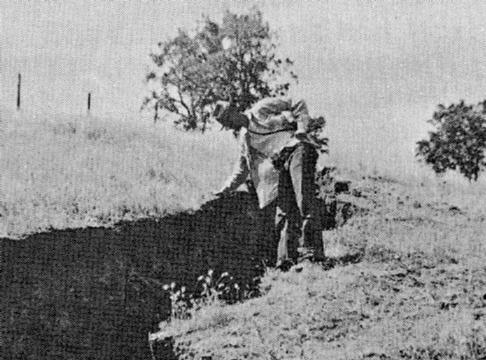 Known length of a fault is not always a predictor of magnitude as in the 1952 Kern County 7.5 earthquake. Seismic evaluations are not required before license renewal. San Onofre was originally licensed to shut down in 2013, but was extended to 2022. The plant was designed in 1973 for a 40 year lifespan. In 2013 Southern California Edison plans to ask for an extension to 2042. A comprehensive seismic analysis has not been conducted on San Onofre since 1995, according to an April 2012 Government Accountability Office report. 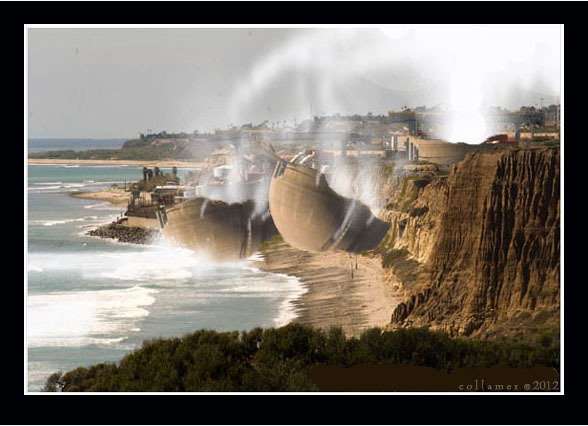 SoCal is being “punked” by the “Powers To Be” since they know that we do not want Whales and or other sea animals harmed by marine sonic blasting either from the Navy or anyone else! In effect we are being TEPCO’d by our Utility and or the NRC; this is not acceptable and I’m sure the new Chairwomen of the NRC who happens to be a World Famous geologist will agree! Teach all the other Utility/Operators not to try and sneak modifications past the NRC! This is a great post, Donna! It is not difficult to envision a progressive failure (i.e. domino effect) being triggered by a major earthquake, when the condition of the steam generator tubes is unknown and the support system design for the tubes is apparently flawed with respect to limiting flow induced vibration effects. Consider a scenario where a major earthquake causes a main steam line to rupture at a location between the steam generator and its main steam isolation valve. The resulting rapid depressurization of the affected steam generator would undoubtably create severe flow-induced vibrational effects in the tube bundle region. How you could model this is anyone’s guess. The enhanced vibrational effects, coupled with higher differential pressure across the tube wall, could result in multiple tube failures and compromise the integrity of the reactor coolant system. With all of the mass/energy release into the containment building atmosphere via the affected steam generator, it is possible that the containment building environmental pressure and temperature may exceed the design limits. In addition, when operating the plant at a reduced power level, the inventory of hot pressurized liquid water in the steam generator would be significantly greater than it is at full power (due to a lower void fraction within the tube bundle), so the amount of mass/energy release into the containment building would be significantly greater than what is predicted for a MSLB while operating at full power. And what is the condition of the patched containment building walls and the dome? Is the rebar that holds the concrete walls in compression sound? Could there be corrosion issues or reduced pre-tension of the rebars? And what is the condition of the internal liner plating and protective coating? The 9:11 time stamp on my last post was not intentional. It just happened that way without me being aware of what the time it was. Now, i’m not really into numerology, superstition, or anything like that, but I do know that sometimes unlikely (and strange) combinations of events happen the way they do for a reason. Can you hear me, Houston? What type of nuclear reactor is he talking about ? Westinghouse Reactors ? 3) 8865 Cracks in Nuclear Reactor Doel-3, Belgium, 2030 Fractures Nuclear Reactor Tihange-2. Tihange-3 shut down because RADIOACTIVE water leaks = the cracks in the Nuclear Reactor Tihange-3 are SO MASSIVE that radioactive water leaks and the Belgian Nuclear Agency FANC still censors the Ultra Sound Inspection Results of the Tihange-3 Reactor, we wonder WHY?!! LARGEST Uranium Enrichment Factory worldwide Pierrelatte Tricastin in WORST EARTHQUAKE ZONE in France, directly on a fault line.